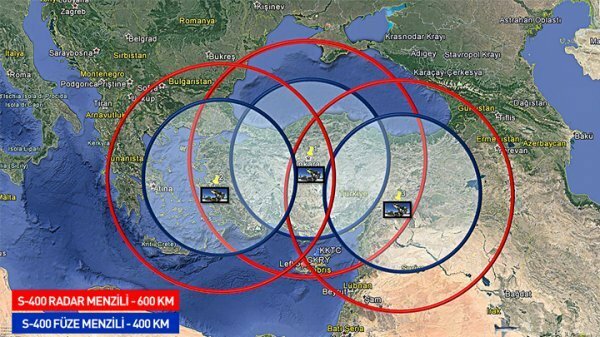 S-400 anti-aircraft weapon system purchased by Turkey has a wide range up to 400 kilometers, and its detection range reaches to 600 kilometers as well. Although the US has been trying to talk Turkey out of purchasing the Russian-made S-400 air defense systems, Ankara seems to have refused to back down. After purchasing and deploying S-400 air defense missile systems, Turkey would increase its influence in the eastern Mediterranean. The deliveries of Russia’s S-400 missile systems to Turkey may be carried out by this July or earlier. Lately, it has been claimed that the range of S-400s could reach 250 kilometers at most. Those claims were denied by Russian news agency Kommersant. According to the information released, this air defense system uses four missiles to fill its performance envelope: the very-long-range (400 km), the long-range (250 km), the medium-range (120 km) and the short-range (40 km).